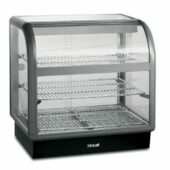 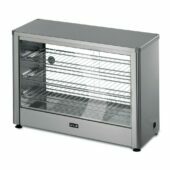 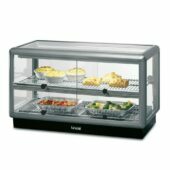 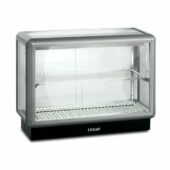 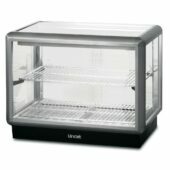 Heated merchandiser units are a cost effective method for keeping pre-cooked food warm for a period of time. 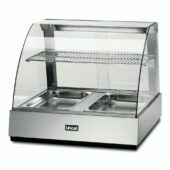 We have a range of merchandisers that have been designed to hold a specified range of food types, including the likes of hot meats, pasties, pies, and also the maintaining of the temperature of food that's been cooked gastronorms in another appliance before being transferred. 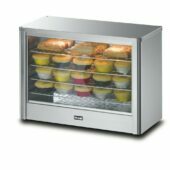 The heated merchandisers that are capable of holding gastronorm dishes can also hold hot foods such as lasagne, pies and vegetables. 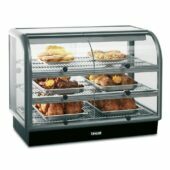 Depending on the size of your establishment there's a heated merchandiser that will be suited to your needs. 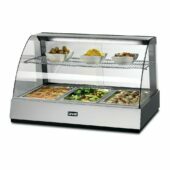 For large cafes and canteens the 650 range curved front heated merchandisers will fit perfectly into any front of house setting, with models that support both back service and self service options. The heated food display showcases are gastronorm compatible for efficient operation, which helps to facilitate the easy transfer of dishes from another appliance to the display showcase for service as and when required. 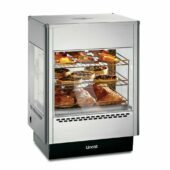 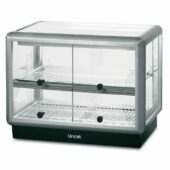 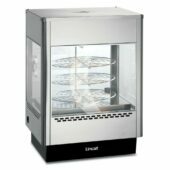 While our upright heated merchandisers are available with a choice of static or rotating racks, for tempting displays of pizza, pies and pastries. This particular range even offers rotisserie options via combination models, which include ovens, bake and display, all in one unit.